Clos Maggiore was once voted the most romantic restaurant in London. The interior of the dining area is the epitome of French elegance – I love the use of wood panelling in the restaurant, and the luxurious, yet intimate and comfortable setting. If you are considering inviting someone to your home for a romantic dinner, but have not quite mastered the culinary skills to impress, Clos Maggiore is your solution. 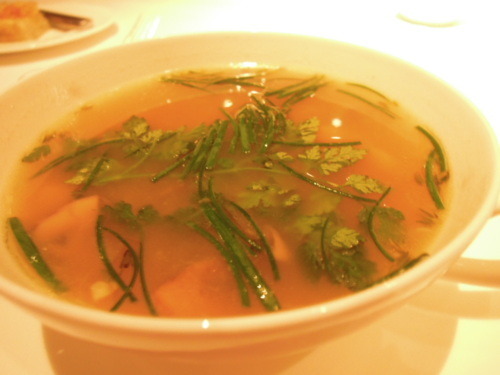 (1) We started off with the Button Mushroom, Chestnut & Parmesan Soup, which was simple and unpretentious, but did not give us any surprises in terms of taste. (2) Then, we had the Chicken Liver & Foie Gras Parfait. It may look plain in the photo below, but the taste was fabulous and the portion was robust! 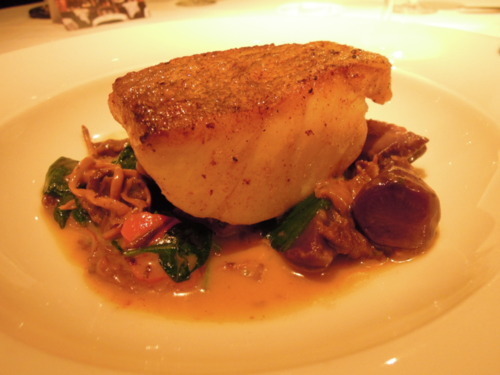 (3) For the main course, I had the Pan Roasted Cornish Pollock, which was tender, juicy and cooked to perfection. I particularly adored the nice, crispy skin! 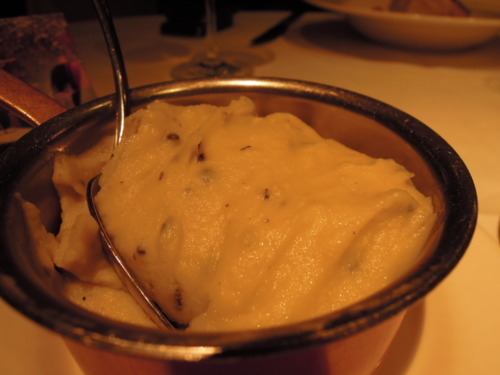 (4) J ordered some Truffle Mashed Potato, and I tried some of it. While the mashed potato was nice (since anything with black truffle in it can never taste too bad), it was not the best mashed potato I have had. Perhaps I had expected more from this acclaimed restaurant! 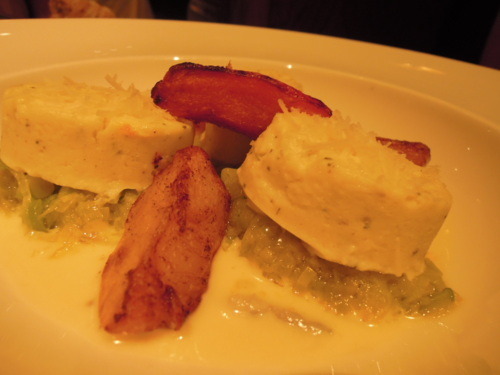 (5) Back to the main courses, we had the Soft Organic Hereford Goat’s Cheese Gnocchi which had a great cheesy taste, but the texture wasn’t very agreeable. The gnocchi was so soft and mushy that I almost thought I was eating mashed potato! (6) Finally, we moved on to the desserts. 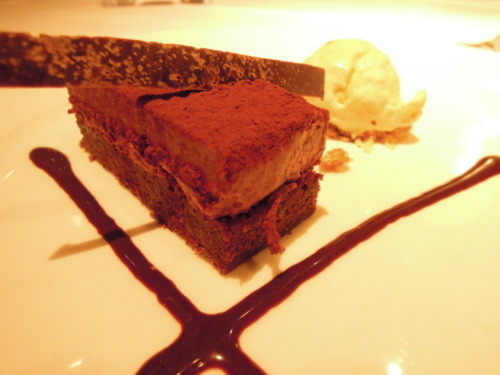 When the Valrhona Chocolate Mousse was served to us, the ice cream has almost completely melted. Unfortunately, the waiter didn’t seem to have noticed, so we had to ask him for a new scoop of ice cream. (Ice cream is always important!) When the round-two chocolate mousse arrived, we thought it was delicious and had a strong, fantastic chocolate taste to it. The vanilla ice cream, however, was icy – they just couldn’t seem to get the ice cream right! 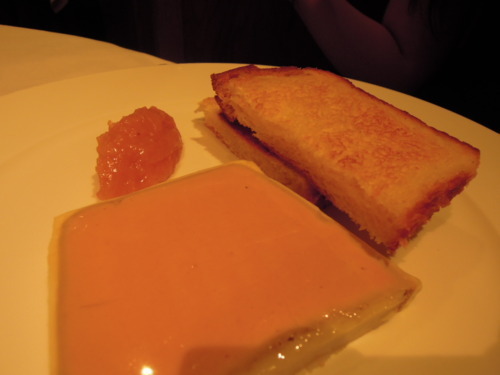 The food at Clos Maggiore was good, and the prices were very reasonable. In terms of service, the staff were generally helpful but lacked professionalism at times. That aside, when you are in such an enchanting restaurant with your loved one, who has time to notice anything else?